The Garden Club of Charleston has partnered with the Joseph Manigault House to present “Charleston’s Antebellum Charms,” a themed floral display. The Charleston Museum presents Holiday Decorations at the Joseph Manigault House,December 6 – 31, 2014: The Garden Club of Charleston has partnered with the Joseph Manigault House to present “Charleston’s Antebellum Charms,” a themed floral display. The Joseph Manigault House is an exquisite antebellum structure that reflects the lifestyle of wealthy urban rice planters in the early part of the 19th century. The Garden Club highlights the magnificent beauty of the Joseph Manigault House with creative holiday arrangements, using only live plant materials that would have been available in the Lowcountry during the first quarter of the 19th century. For more information, visit www.charlestonmuseum.org or call (843)722-2996. The Historic Charleston Foundation presents Yuletide in the Lowcountry HolidayExhibitions, end of November 2014 – early January 2015: Visitors are invited to experience the feasts, decorations and local traditions of Historic Charleston Foundation’s two museum houses, the Nathaniel Russell House, constructed in 1808 and the circa 1820 Aiken-Rhett House. Guests will experience Christmases past and learn the evolution of holiday traditions in Charleston through the display Yuletide in the Lowcountry. Beginning at the Nathaniel Russell House Museum, guests will learn about elegant early 19th century family gatherings replete with holiday embellishments collected from local flora. 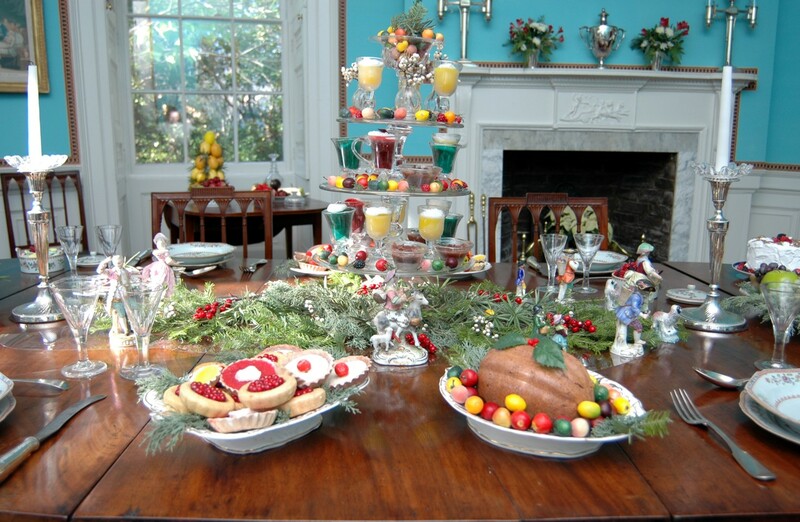 Visitors will observe the time-honored Victorian trimmings of a Lowcountry Christmas dinner in 1860 at the Aiken-Rhett House Museum. House museums hours of operation are 10 a.m.-5 p.m., Mon. through Sat. ; 2 – 5 p.m., Sunday; last tour begins at 4:15 p.m. Closed on Christmas Eve and Christmas Day. Reservations are needed for groups of 12 or more. For more information, visit www.historiccharleston.org or call (843) 724-8485. South Carolina Historical Society presents the 7thAnnual Winter Lecture Series, January 20 – March 10, 2015: The South Carolina Historical Society will host a series of lectures this winter highlighting “South Carolinians You Should Know.” A few highlights include Robert Mills, a Charlestonian who famously designed the Washington Monument, and Anne Pamela Cunningham, a South Carolinian who salvaged Mount Vernon through donations and the creation of “The Mount Vernon Ladies Association,” which continues to manage the property today. Lectures will be held on Tuesday evenings from 6 – 7 p.m. at the historic First Baptist Church in downtown Charleston. Please join the SCHS each Tuesday to learn more about South Carolina and its contributions to our national history. For more information, visit www.southcarolinahistoricalsociety or call (843)723-3225. One of Charleston’s top hotels, Belmond Charleston Place, channels the heart and soul of this South Carolina city and its watery surroundings with a new By Land and By Sea package. Geared especially well for single parents traveling with their kids, it ensures that every generation is happy both inside and out (and both indoors and outdoors!). Charleston is most definitely a seaside town. The historic harbor is just blocks from the hotel, and was the scene of the opening shots in the Civil War. For centuries, it has welcomed ships from all over the world and today sports recreational boaters, pods of dolphins and more. Tours are booked at time reservation, additional guests pay the standard tour fees. One complimentary meal is provided from the Children’s Menu, per paid adult meal, at the hotel’s Palmetto Café, Thoroughbred Club and Charleston Grill. (In-room dining is not included). Charleston Place hotel’s family friendly amenities also include an infinity edge pool, a full-service spa with a menu of kid-friendly services, and a special “kids concierge” listing that highlights some of the city’s best offerings for the under-21 set. Rates start at $314 per night, and the package is available through September 7, 2014. Consistently ranked among the best hotels in the world by the readers of Condé Nast Traveler and Travel + Leisure magazines, Belmond Charleston Place evokes the feeling of a grand, 17th century residence, from its lush personal suites to the Italian marble lobby with its signature Georgian Open Arm staircase and 12-foot crystal chandelier. The staff of the hotel is dedicated to indulging its guests with the finest in Southern hospitality, and has become the choice of celebrities, princes and politicians. Guests can enjoy the hotel’s full service European-style spa and horizon-edge swimming pool with retractable glass roof. The hotel is centrally located, surrounded by historic homes and buildings, and within strolling distance of the city’s delightful shops, galleries and restaurants. To book, please call 800-383-2335, or for more information, visit www.charlestonplace.com. Owned and operated by Orient-Express Hotels Ltd., Belmond is a global collection of exceptional hotel and luxury travel adventures in some of the world’s most inspiring and enriching destinations. Established over 30 years ago with the acquisition of Belmond Hotel Cipriani in Venice, its unique and distinctive portfolio now embraces 45 hotel, rail and river cruise experiences in many of the world’s most celebrated destinations. From city landmarks to intimate resorts, the collection includes Belmond Grand Hotel Europe, St. Petersburg; Belmond Maroma Resort & Spa, Riviera Maya; and Belmond El Encanto, Santa Barbara. Belmond also encompasses safaris, six luxury tourist trains including the Venice Simplon-Orient-Express and three river cruises. Orient-Express Hotels Ltd. also operates ‘21’, one of New York’s most storied restaurants.Visit belmond.com.